Tall beggarticks is an annual member of the daisy family that is found across North America, with the exception of some states and provinces in the extreme north and south (USDA 2011). It is a wetland species that is found in ditches, shores of lakes and streams, swamps, marshes and moist woods, as well roadsides, railroads, fields, waste areas (Strother and Weedon 2011). In describing its occurrence in the Fraser Valley, Lomer (2011) says: "Despite the name, this species is very rare and not weedy in BC. It was found in the Fraser Valley for the first time during the BC Conservation Data Centre survey in 2008. A relatively small population was discovered in a ploughed field below Sumas Mountain (UBC: Lomer 6829) growing with Bidens amplissima Greene, Bidens cernua L. and Bidens tripartita L. I assume this population was introduced unintentionally as part of waterfowl enhancement plantings, so the origin may be from outside the province. Not observed in the natural wetlands nearby and not expected at other sites in the Fraser Valley, except perhaps as an introduction. It can be told from the common Bidens frondosa L. by its more numerous flower head bracts, yellower disc flowers, wider fruit and sturdier habit." Extracted from Botanical Electronic News #432, January 2011, with permission. Annual herb from a fibrous root; stems erect, branched, more or less glabrous, 0.3-1.8 m tall. Basal leaves lacking; stem leaves pinnately compound with 3-5 lanceolate, stalked, opposite, saw-toothed leaflets 5-15 cm long and 1-3 cm wide, sometimes sparsely short-hairy below. 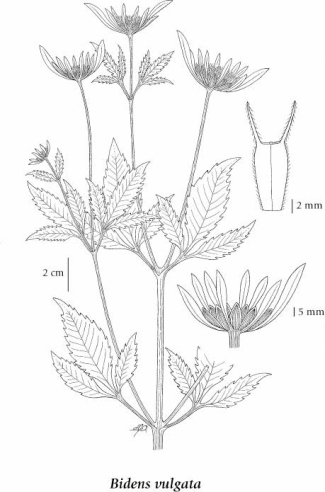 Heads with ray and disk flowers, bell-shaped, few to many in an open inflorescence; involucres 13-25 mm wide; involucral bracts in 2 dissimilar series, the outer ones 10-16, green, leafy, densely hairy, unequal, erect to ascending, linear, longer than the disk, 1-2 cm long, the inner ones erect, narrowly egg-shaped, 7-12 mm long; ray flowers 1-5, yellow, 2.5-3.5 mm long, shorter than the involucral bracts; disk flowers pale yellow, about 3 mm long. Achenes 6-12 mm long, olive brown or somewhat yellowish or darker, compressed; pappus of 2 retrorsely-barbed awns, 3-6 mm long. Moist to wet ditches, streambanks and lakeshores in the steppe and montane zones; rare in S BC east of the Coast-Cascade Mountains; E to PQ and S to TN, WY, NV and CA.